A self-recorded memoir by Floyd King taped in December 1973 in response to questions from circus historian Tom Parkinson. Floyd King (1988-1976) began circus work as a press agent with the Al G. Barnes Circus and the Hagenbeck-Wallace Circus, before partnering with his brother, Howard King, in 1919 to create the Sanger's Great European Shows. King owned and operated many shows during the 1900s-1950s, including Hugo Bros., Walter L. Main, Gentry Bros., Cole Bros. Circus, and the King Bros. Circus, and he later worked as general agent for the Clyde Betty Circus and adviser for the James H. Drews Shows. King is a member of the Sarasota Circus Ring of Fame and the Circus Hall of Fame. Floyd King (at left) standing in front of a ticket wagon, circa 1930. ​This wagon can be seen at far left in the picture below. 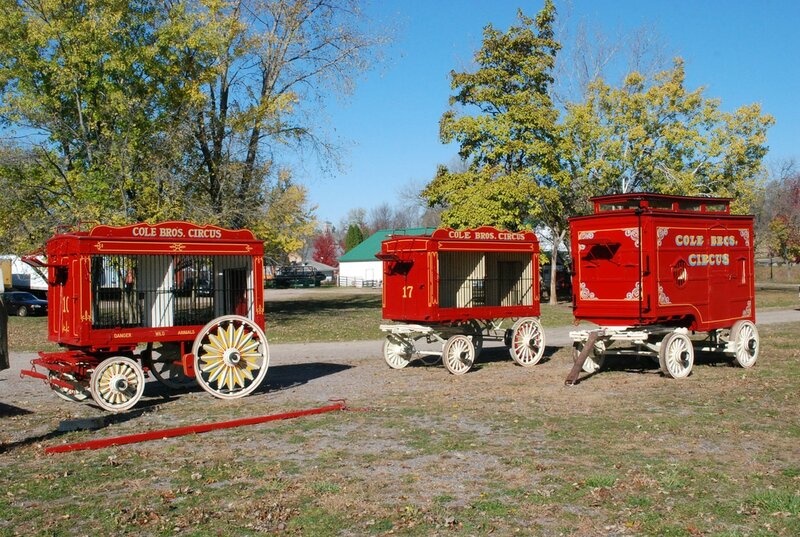 Three wagons owned by Floyd and Howard King and used on the Cole Bros. Circus, 1925-1930.